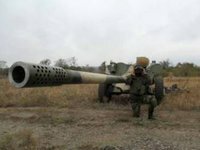 The Ukrainian Ground Force of the Armed Forces of Ukraine command has dismissed media reports of howitzers having been destroyed after Russian hackers broke into Ukrainian artillerymen's software. "The information of the Command of Missile Troops and Artillery of the Ukrainian Ground Forces is that losses in artillery weapons during the Anti-Terrorist operation were way below those reported [by the media, which claimed 80% of D-30 howitzers were lost] and have nothing to do with the stated cause. Currently, missile and artillery units of the Ukrainian Ground Force are entirely combat-ready, equipped and capable of performing assignments," the ministry said on its website. The Defense Ministry asks journalists to make public only verified information received from the competent official sources.